It was taco Thursday the other night. I know, I know. Typically you have that whole taco Tuesday thing going on, but let’s be honest, sometimes we never hit that mark due to schedules, etc, and who could not eat nachos any day of the week, right? As my kids typically would yell out their go to dinner idea (bacon burger, hot dogs, steak), my wife always leans towards nachos. So nachos it was. I’m the one who loads those nachos up. My kids are typically meat and cheese, and I force them to go for the lettuce or avocado, and my wife is pretty good at loading her’s up with the exception of things like olives and jalapeños. With that said, I had some nacho ingredients left over, and the following day my expectation was to use those up for breakfast. As I had set out the leftovers in the morning, my initial thought was to scramble everything up into some sort of nacho omelette, but that’s when the idea sparked, and hence came the crispy waffle nachos! Talk about the best breakfast, possibly ever. 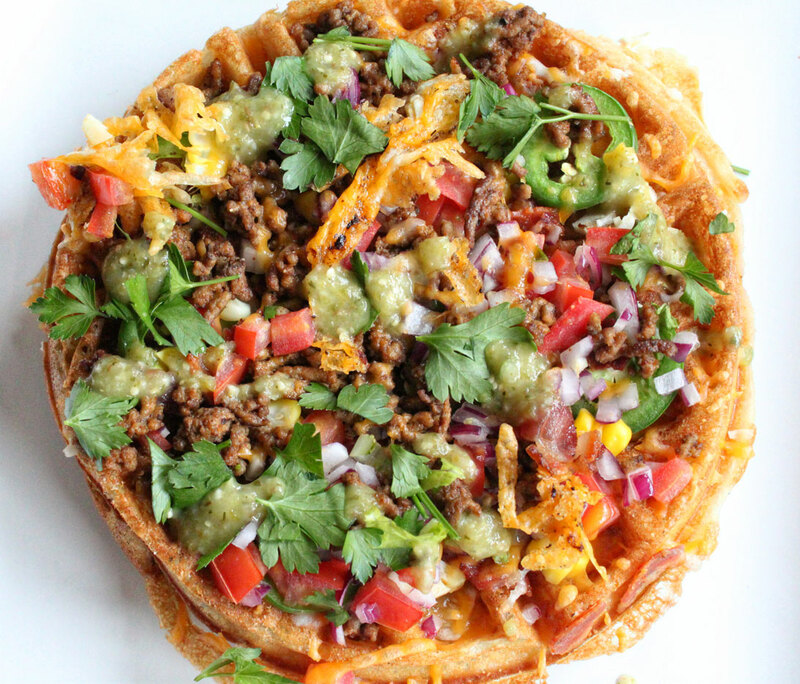 You get the sweetness from the crips waffle, and the savoriness from all of the leftover nacho ingredients. Did I mention bacon? Now I am going to let you decide on how you want to load up your nachos, as this becomes a personal preference by many. Regardless, here is what I used to give you some sort of roadmap in building your own. Now if you want to take the easy route and use up frozen Eggo brand waffles, so be it, but if you have a waffle iron, then make your own. They are better, and better is good. Start by mixing your waffle ingredients, and mix until everything is incorporated. Add in half of the cooked and crumbled bacon, and all of the minced garlic, and give another mix. Let this rest for about 5 minutes. Next, heat your waffle iron, on high heat. Spray just a bit of cooking spray onto eat of the griddles. Ladle in the waffle batter, close and let the waffle cook. The addition of the melted butter will get these waffle nice and golden crisp. Once the waffle is fully cooked, and crisp, remove it from the waffle iron, and place into the skillet with some of the reserved bacon grease. We are going to finish this in the oven to get the cheese, and other ingredients nice and warmed through. Start building your waffle nachos. 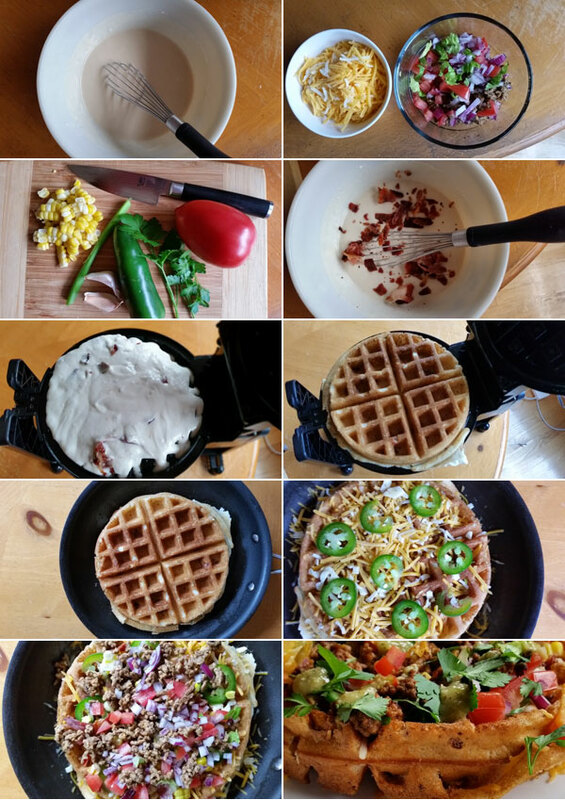 Add most of the the cheese to the top of the waffle, along with the ground beef, red onions, tomatoes, jalapenos, corn, and remaining bacon. Top with any remaining cheese to hold everything together, and place into the preheated oven for about 5-7 minutes or until the cheese is nice and melted. Remember, use your hot mit to remove the skillet from the oven. Mentally it’s easy to just think you can grab the handle of the skillet, but do not do that! Once removed, slide the waffle onto your serving plate, and finish with the green onions, fresh cilantro, and the hot sauce. Time to dig in! Talk about a masterpiece in nacho town, this thing was awesome. I’m kind of glad no one was around at the time because I tore into this thing. 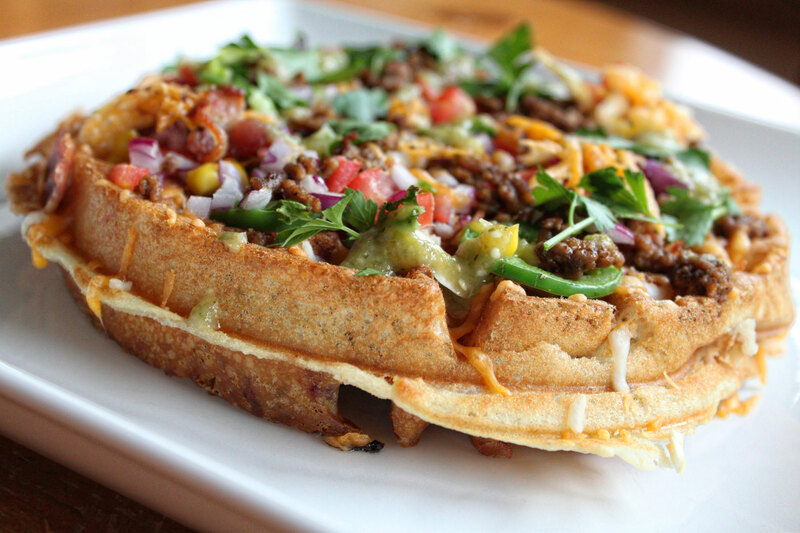 You get the crispy waffle and everything you love about the nacho, but the sweetness of the waffle itself really set this one apart from the others. This would be a perfect brunch idea as well. Anyway, I hope you enjoy! Ladle in the waffle batter, close and let the waffle cook. The addition of the melted butter will get these waffles nice and golden crisp.